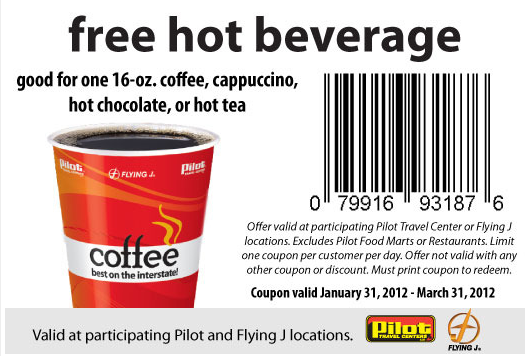 Click on the “Like” button on the Pilot & Flying J Travel Center Facebook Page and you’ll be able to print a coupon for a free 16-oz. hot beverage at any Pilot & Flying J Travel Center. This offer is good through March 31, 2012. My husband is a truck driver and LOVES Pilot:) (you can print more than 1) It says 1 per customer per day!